Author theQuotes.mePosted on July 15, 2018 May 16, 2018 Categories Actors, Gabriel Macht, Harvey Specter, Mike Ross, Suits, TV ShowsTags Aaron Korsh, against the ropes, against the rules, associate, beg, Break, break the law, care about, care about you, Characters Welcome, Christopher Misiano, cloude, clouded, college dropout, Corporate, Court, Donna, Donna Paulsen, Donna Paulsen Quotes, Donna Quotes, E espionage, each other, Episode 12, flashback, friendship, Hard Truth, Hard Truths, Harvard, Harvard graduate, Harvey, Harvey and Mike, Harvey Specter, help, high and dry, judge, judicial, judiciary, law, law and order, Law firm, Lawyer, legal drama, legal ethics, Louis Litt, Manhattan, mature, Mid Season, Mid Season Break, Mike, New York, new york city, one word episode title, one word series title, paralegal, past, Patrick J. Addams, Pearson Darby Specter, Pearson Hardman, Pearson Specter, Pearson Specter Litt, photographic memory, Power, request, rivalry, Sarah Rafferty, Sarcasm, Season 7, Suits, Suits Quotes, Suits Season 7, Suits Season 7 Quotes, Suits TV Show, Suits TV Show Quotes, Suits USA, Support, TV Show, TV Soap, year 2011, year 2018, Young, Young Harvey Specter, Young Louis Litt, younger version of characterLeave a comment on Trust? Author theQuotes.mePosted on April 15, 2018 May 16, 2018 Categories Actors, Gabriel Macht, Harvey Specter, Suits, TV ShowsTags A is for attitude, Aaron Korsh, Allied, Apartment, associate, attitude, Banter, Be Ready, Beginning, Believe, Blackmail, Boom, building, Cameo, candle, Chance, Characters Welcome, college dropout, Court, court room, Currie Graham, Donna, Donna Paulsen, Drama, drug test, Episode 2, Eric Ladin, Errors and Omissions, Fictional Character, friendship, Gabriel Macht, George, Gina Torres, Gregory Boone, Gun, Gun on head, Gun to head, hard work, Harvard, Harvard graduate, Harvey Specter, Harvey Specter Quotes, headband, help, intrigued, Jessica Pearson, Joanne Reece, John Boyd, Jon Cor, judge, Judge Donald Pearl, Judge's Aide, judicial, judiciary, Lauren Pearl, law, Law firm, legal, legal drama, legal ethics, Legend, locker-room, M is for motivation, Manhattan, Maurice Godin, Meghan Markle, Memorable Quotes, Mike Ross, Motivation, Nazanin Boniadi, New York, new york city, one word series title, paralegal, partners, patent, patent application, patent case, Patrick J. Adams, Pearson Darby Specter, Pearson Hardman, Pearson Specter, Pearson Specter Litt, photographic memory, prototype, Rachel Zane, response, Rick Hoffman, rivalry, Sarah Rafferty, Sarcasm, Season 1, Season 7, startup, Suits, Suits Quotes, Suits Season 7, Suits Season 7 Quotes, Suits TV Show, Suits TV Show Quotes, Technology, tennis, tennis club, The Batman, together, Tom Keller, TV Show, Wyatt, year 2011, year 2017Leave a comment on Gun to your head? Mike reminded Harvey what his true skills are. It is to attack and win. Jordan might have been the best defensive players of all time but that’s not what people remember him for. 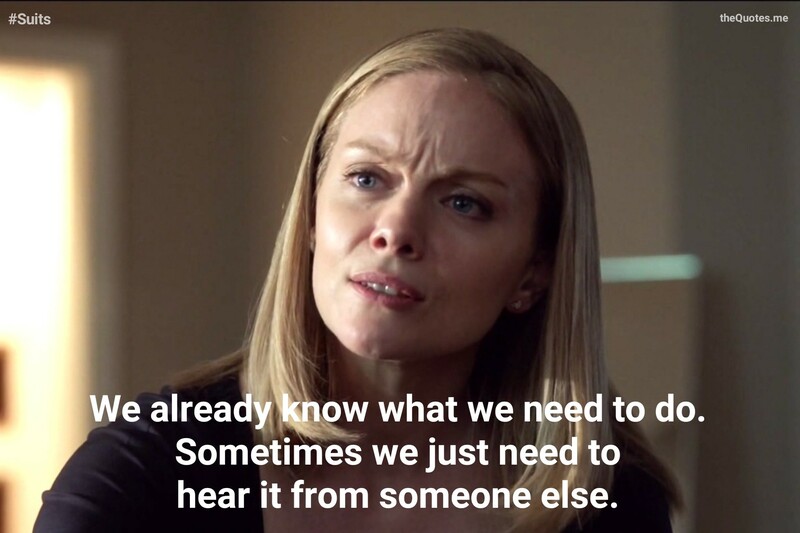 Author theQuotes.mePosted on January 15, 2018 January 26, 2018 Categories Gabriel Macht, Mike Ross, Patrick J. Adams, Suits, TV ShowsTags ability, attack, attitude, basketball, celebrity, defense, Episode 9, Go, Harvey Specter, knock it, Memorable Quotes, Micheal Jordan, Mike Ross, Motivation, Patrick J. Adams, player, reference, Season 7, Shame, skill set, sports, success, Suits, Suits Quotes, Suits Season 7, Suits Season 7 Quotes, Suits TV Show, Suits TV Show Quotes, TV Show, winLeave a comment on Go, knock it out. 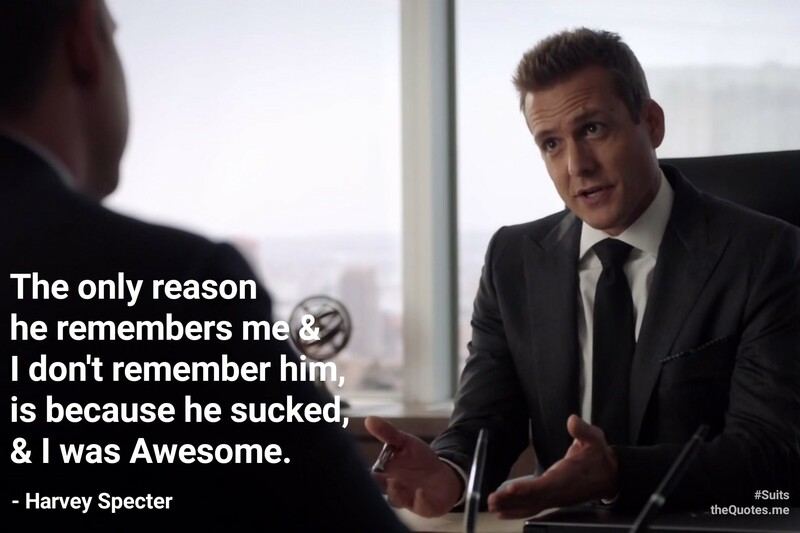 Author theQuotes.mePosted on December 15, 2017 December 20, 2017 Categories Actors, Gabriel Macht, Harvey Specter, SuitsTags Aaron Korsh, attitude, awesomeness, bravo, Episode 9, Fictional Character, Fight, Gabriel Macht, Harvey Specter, Law firm, Lawyer, like a boss, Mike Ross, Power, remember, Remember Me, Sarcasm, Sarcastic, Sarcastic Quote, Season 7, spirit, Suits, Suits Quotes, Suits Season 7, Suits Season 7 Quotes, Suits TV Show, Suits TV Show Quotes, TV Character, TV Quote, TV Show, TV Soap, Wall St.Leave a comment on Do you remember him? Author theQuotes.mePosted on August 23, 2017 November 3, 2017 Categories Actors, Gabriel Macht, Harvey Specter, Suits, TV ShowsTags Dr. Paula Agard, Episode 6, Harvey Specter, home, opinion, professional, psychology, Season 7, self knowledge, sociology, Suits, Suits Quotes, Suits Season 7, Suits Season 7 Quotes, Suits TV Show, Suits TV Show Quotes, TV Show, What to doLeave a comment on What should I do?